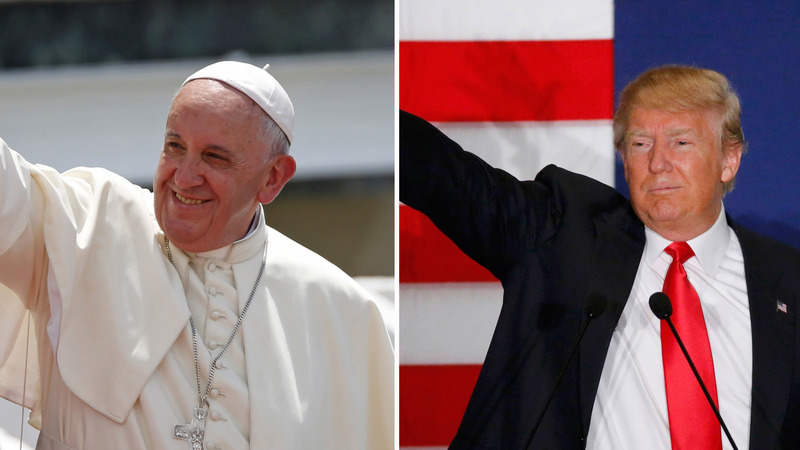 Pope Francis: Donald Trump "is not Christian"
Pope Francis wasn't willing to advise Catholics on whether to vote for Donald Trump, but on the subject of his religious life, the pontiff suggested Trump is "not Christian," if some of the things he's said on immigration are true. "A person who thinks only about building walls, wherever they may be, and not of building bridges, is not Christian. This is not the gospel," Francis told reporters traveling with him back to the Vatican at the conclusion of a trip to Cuba and Mexico. Just before the pope's comments were made public, Trump had some nice things to say about him - even regarding his position on immigration. "I heard the pope and I respect the pope and I love the pope in many ways. I love what he stands for and I like his attitude. He's very independent and he's very different," he said in an interview on SiriusXM and Breitbart News Daily. "I really respect the fact that he sees both sides. You know a lot of people are inflexible - they won't change." Immediately after the pope's comments were made public, however, that changed. "For a religious leader to question a person's faith is disgraceful. I am proud to be a Christian and as President I will not allow Christianity to be consistently attacked and weakened, unlike what is happening now, with our current President," Trump said in the statement. "No leader, especially a religious leader, should have the right to question another man's religion or faith." He went further, saying, "If and when the Vatican is attacked by ISIS, which as everyone knows is ISIS's ultimate trophy, I can promise you that the Pope would have only wished and prayed that Donald Trump would have been President because this would not have happened." The businessman said that Francis had "only heard one side of the story" and hadn't seen the crime, drug trafficking, and negative economic impacts on the U.S. He also slammed the Mexican government, saying they are "using the Pope as a pawn and they should be ashamed of themselves for doing so." Trump's supporters seemed unmoved by the pope's comments and determined to stand by their candidate. Why is the Pope talking about U.S politics? Baxter Russell, a 43-year-old Trump supporter who attended Trump's event in Kiawah Island, South Carolina, where he responded to Pope Francis, said Trump's reaction was "appropriate." "I thought he needed to let people know why the Pope was saying derogatory things about him and the reason behind it," Russell said. He said that many politicians would have avoided responding, "but Mr. Trump is someone who faces issues. It's not the first time Trump and the Pope have criticized the other through the media. Francis was responding to a reporter who asked about Trump's recent comments that Francis is "very political" and that Mexico was using him to convince the U.S. to leave its southern border unsecured. "Thank God he said I was a politician because Aristotle defined the human person as 'animal politicus.' So at least I am a human person," Francis said. "As to whether I am a pawn, well, maybe, I don't know. I'll leave that up to your judgment and that of the people." While Trump has promised to build a wall on the Mexican border (and get Mexico to pay for it) and called Mexican immigrants rapists and criminals, Francis has openly shown support for migrants who have died trying to reach the U.S. During his trip, he walked along the U.S.-Mexico border fence and said immigration is spurred by a "humanitarian crisis" at a mass in Juarez, just 50 years from the U.S. border. "I am not going to get involved in that," he said. "I say only that this man is not Christian if he has said things like that. We must see if he said things in that way and I will give him the benefit of the doubt." In the past, Trump has criticized the Pope for being "not Pope-like" by waiting to pay his own bill at the front desk of a hotel, but has otherwise been complimentary of the Holy See. In fact, he said Francis would be his first pick for his reality show, "Celebrity Apprentice," if the person was guaranteed to say yes. I don't like seeing the Pope standing at the checkout counter (front desk) of a hotel in order to pay his bill. It's not Pope-like! "@mgmacdon: @realDonaldTrump if they had to say yes, who would your first pick to be on the celebrity apprentice?" The Pope! The new Pope is a humble man, very much like me, which probably explains why I like him so much!